This might be a slightly odd choice for the first record to write about that I picked up in Japan. But, as I've been out of commission with the sickness for the past few weeks, I haven't really gotten the chance to spend as much time with most of the new records that I bought. Put On Fresh Paint, however, is an album I've been listening to for almost 20 years, making it much easier to write about. This isn't the Japanese version of this Husking Bee album. I looked for the Japanese version while in Tokyo, but I didn't come across it. However, I did find the version on Doghouse records and it was only four dollars. So to me, that's an easy buy and I'll have to keep looking for the Japanese one. I first heard of Husking Bee a couple of years before Doghouse put out the album in America. Back in the 90's, I used to run Snuff's website. As their fanbase was much more based in the UK and Japan rather than the US, I ended up with a lot of people from other countries getting in touch with me. One of those people was a fellow named Tetsu from Japan. We struck up a friendship and used to send each other records that we thought the other would like. Husking Bee was one of the bands he sent me. 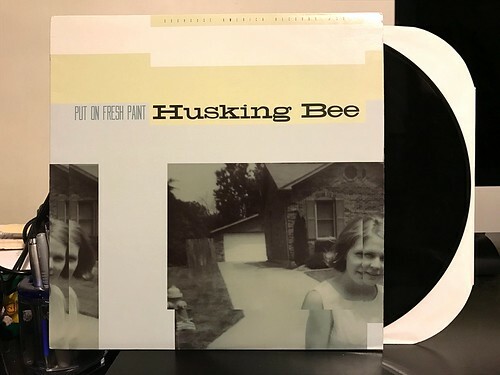 Of Husking Bee's pretty extensive catalog, Put On Fresh Paint and their first album Grip were always my favorites. They played a super catchy strain of melodic punk rock with those catchy choruses that I love so much. The vocals are somewhat gruff, but still very tuneful. The guitar riffs are big and full and they always manage to sneak in an extra hook or breakdown that really sets their songs apart from your run of the mill pop punk band. I am excited to have this on vinyl finally and it was great to get it at such a cheap price, but part of me is now even more obsessive about finding the Japanese version of the vinyl. That's OK though, maybe it gives me another excuse to try to get back to Japan.